Indeed, a good slider can be quite an effective pitch, and the aforementioned Lyle made an entire career — including a Cy Young Award — depending almost exclusively on that one pitch. However, I’m going to tell you today, that if you are under the age of twenty, do not add it to your repertoire. If you are over 20 years old, and you have good command of your fastballs and a changeup, and you are having trouble with developing a curveball, then consider the slider, but use it sparingly. The problem with the slider is that pitchers, pitching coaches, and managers fall in love with it, and want to throw it all the time, in all situations, and often want to throw it for strikes. However, the slider is not meant to be thrown for strikes, and therefore is not a pitch to be used regularly. The purpose of a slider is to convince the batter a fastball is coming, and get him to swing and miss it, or at worst allow him to get just a piece of the ball and ground out or pop up weakly to an infielder. An effective slider is all about the element of surprise, and is one of the few “trick” pitches that can induce a strikeout at a critical moment in the game. Unfortunately, what happens is a pitcher throws a decent slider early in the game, gets a strikeout, and then continues to use the pitch over and over, to nearly every batter, throughout the course of the game. After it is thrown a few times every inning (or to every batter), it loses its element of surprise; the batters start looking out for it. Worse, if a pitcher is throwing it often, then he probably is trying to get it in the strike zone a good portion of the time. What’s wrong with that? Well, a good slider breaks very late, and breaks down and out of the strike zone. In order to throw it for a strike, the pitcher has to release the slider a little earlier, which starts it on a higher plane, which in turn nullifies the possibility of a late break and usually eliminates the down break. In effect, he throws a flat slider (also known as a fat slider, because it is a fat pitch for the batter): it breaks sideways, on a mostly even plane. When a pitch breaks sideways, the batter has a much easier time meeting the ball with his bat, as the arc of the swing is on a similar plane of the pitch. Since a flat slider comes in on a level plane, and is by nature a few MPH slower than a fastball, a good hitter should crush the pitch for an extra-base hit. Another major issue with throwing too many sliders is the toll it takes on the arm, particularly on the elbow. Ever wonder how it is that these days, so many college and professional pitchers need Tommy John surgery? 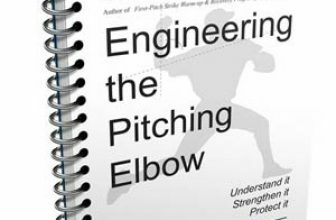 You would think that with the advances in medicine, training, and overall knowledge of pitching mechanics, that people wouldn’t be hurting their arms. 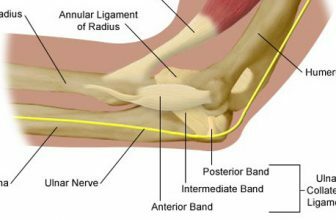 However, it seems that every pitcher above Little League is throwing sliders 30-50% of the time, and this pitch puts a tremendous strain on the tiny, fragile tendons in and around the elbow. 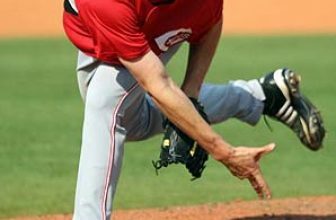 Even if you throw the pitch with perfect mechanics, you will probably at least strain the tendons a bit. If you throw the pitch with imperfect form, you’ll put even more of a strain on the tendons and the ligaments, and eventually tear something. If the slider is so bad for your arm, and not effective as a pitch for strikes, why are so many kids throwing it? Simple: because it is an easy pitch to learn, and a pitcher can fool enough poor hitters to be moderately successful. Look at the Major Leagues today and you will see a remarkable number of pitchers who throw the slider as their primary breaking pitch; you should also take note of the fact that 90% of these pitchers are only moderately successful, and that Major League Pitching as a whole is at the worst level of skill and performance in the history of baseball. All of these pitchers learned a slider because it was a shortcut; it was a lot easier to pick up a slider than it was to develop a good overhand curveball. Or, it was quicker to throw a mediocre slider that got a lot of weak batters to swing and miss, than it was to learn how to make a fastball move enough to jam even the best hitters. Sliders are a shortcut for ineffective, lazy pitchers. Pitching coaches love to see batters swing and miss; too many think this is the core goal of a pitcher. And there is no doubt that even a mediocre slider will cause 60-80% of batters to swing and miss, most of the time. However, a good hitter will recognize a bad slider, and if given the opportunity, will mash it over the fence. Eventually, even the poor hitters will realize what’s coming — the good hitters will tell them about that bright red dot — and they’ll hit it too. The very best pitchers, at every level, learn that 1.) command of the fastballs and the changeup are paramount to success; 2.) being efficient with your pitches is a better strategy than trying to strike everyone out; and 3.) the overhand curveball is the best breaking pitch, because it can be thrown for strikes and it can induce ground balls. If you must have a slider in your repertoire, use it wisely. It should be aimed at the outside corner (opposite of your throwing hand), out of the strike zone and down. In fact, the ideal target for the pitch is the catcher’s right foot (for a righthanded pitcher), with the catcher situated so that his belly-button is directly lined up with the black on the outside corner of the plate. At most, you should throw it five times a game in a nine-inning contest, and used most frequently on two-strike counts, in situations where you absolutely, positively, must get a strikeout. Used appropriately, it can be a very effective weapon in your pocket, to pull out every once in a while. Overused, it will eventually be hit hard, and put undue stress on your arm. Before you try to throw a slider,? learn how to move your fastball in, out, and down, and develop a change-up that dives down to the right and down to the left. It’s boring, I know, but if you can truly command those pitches you’ll never need a slider to be successful — even at the Major League level. Back Balk? Or Base Hit?